Representatives of SMK Damansara Jaya with their championship trophies. KUCHING: SMK Damansara Jaya (Team A) was crowned champion at the ninth Swinburne Sarawak Inter-School Debating Championship after beating SMK Sri Permata (Team A) of Selangor in the contest organised by the Swinburne Debaters’ Club recently. Debating on the motion ‘This House would punish companies for neglect of their models’ the team of Deborah Wong Kai Wai, Kenneth Foo Wui Kit and Ng Yong Shen from SMK Damansara Jaya in Petaling Jaya, Selangor, erupted in jubilation after they were announced as winners by chief adjudicator Kasun Illankoon. Wong’s whip speech won her the honour of being judged the Best Debater in the finals. This was the icing on the cake as she had earlier won the coveted Overall Best Debater in the preliminary rounds. The team of Roshan Sivabalan, Aidan Adam and Nimalan Gunandran of SMK Sri Permata (Team A) settled for first runner-up. In the junior category, SMK Sri Permata (Team C) and Kolej Yayasan Saad Melaka (Team C) debated on the motion ‘This House would not streamline students based on intelligence’. Kishen Sivabalan, Siddharta Adaikalaraj and Seaan Manuel Pillay proved the better team and were awarded the champion trophy while the Kolej Yayasan Saad Melaka team comprising Benjamin Ooi Tian Wei, Haziq Zikry Mokhtar and Nurmaisarah Abdul Hanzalah collected the first runner-up title. SMK Sri Permata’s Kishen Sivabalan won the Best Debater in this category’s finals while his teammate Siddharta Adaikalaraj captured the top Best Overall Debater in the junior category’s preliminary rounds. Meanwhile, St Joseph’s Private School won the Most Promising Junior Team Award after successfully entering into the quarter finals. The senior category for Most Promising Team was awarded to St George’s School of Brunei, a first time participant in the annual event. Jerry Tan Hai Kok of SM Lodge was the Best English Speaker in the senior category while Sarah Liaw Hui Mei of SMK Chung Hua Miri took the award in the junior category. Thirty schools represented by 90 teams competed in the tournament. Up from five schools last year, this year’s championship saw ten schools from Peninsular Malaysia taking part, and one from Brunei. Adjudicators, or judges, for the championship were mostly independent individuals with significant experience in debating and adjudicating. They included former debating champions at national, regional and international levels with adjudicating experience. Other adjudicators included Swinburne Sarawak lecturers as well as senior members of the university’s Debaters’ Club, participating school teachers and several alumni of the Swinburne Sarawak Inter-School Debating Championship itself. Former champions and participants from SMK Batu Lintang, SMK Green Road, Lodge International were among these. The chief adjudicator was Kasun Illankoon from Sri Lanka. An avid debater since his years as an undergraduate at Swinburne Sarawak, Kasun will be completing his postgraduate studies at the university this year. 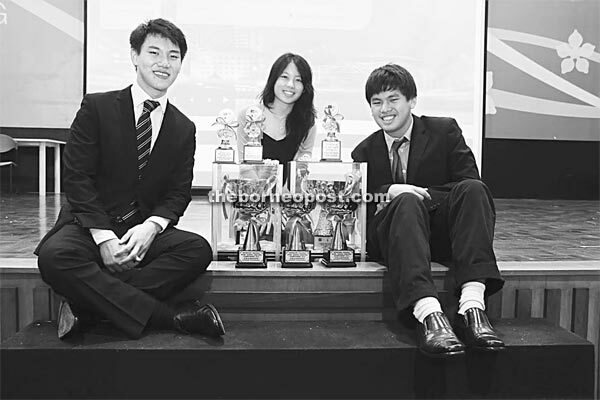 He was assisted by Albert Kamalendra and Kevin Tan, who have trained debaters for state. extensive expertise and long involvement training debaters in the state. The championship was established to encourage students of secondary schools in the state to debate in English and hone their oral and communication skills, reasoning and critical thinking. Last year, the championship was won by SMK Batu Lintang.